The U.S. Army has selected General Dynamics (NYSE:GD) and BAE Systems (NASDAQOTH:BAESY) to build prototypes of a new armored, tracked vehicle, setting up a battle for a contract that could be worth more than $6 billion and open the door for further opportunities. The Army awarded BAE $375.9 million and General Dynamics $335 million to build 12 prototypes of the Mobile Protected Firepower (MPF) vehicle for delivery in 14 months. The companies beat out Science Applications International Corp. (NYSE:SAIC), which had also entered a design in the initial competition. The Army hopes to eventually buy 504 of these vehicles, which are designed to provide direct fire support to fast-moving infantry divisions that currently often engage without armored vehicle backing and armed mostly with howitzers and personnel-carried weapons. The Army wants the vehicles to be small and lightweight enough that two could be shipped aboard a single C-17 military transport plane, but fire a projectile not much smaller than what the larger Abrams M1A2 tank fires. General Dynamics is hoping a version of its Griffin design if what the Army is after. Image source: General Dynamics. The vehicle would fill a gap in the Army's portfolio that has existed since the 1996 retirement of the M551 Sheridan tank. General Dynamics is offering a vehicle that combines a version of its Abrams turret with a hull modeled off the Ajax vehicle it is developing for the British Army, which the company hails as a mix between proven technology and new design. A win here would set the company up nicely for other contracts as well: GD is pushing another variant of the same Griffin design in the competition to build the larger Optionally Manned Fighting Vehicle (OMFV), which will eventually replace thousands of Army M2 Bradley armored troop carriers. The company could try to cross-sell the Army on the advantages of buying variants of one design for both missions, arguing that it would simplifying training and maintenance, and allow the service to more cost-effectively stockpile replacement parts. BAE, meanwhile, is offering a vehicle based on the M8 Armored Gun System originally developed in the late 1980s as a replacement for the Sheridan tank before eventually being abandoned. The company has modernized the design with new capabilities and components, and touts it as simpler to maintain because it allows easy access to the engine and transmission without the use of heavy equipment. Rendering of the BAE entry into the Mobile Protected Firepower vehicle competition. Image source: BAE. Though BAE, maker of the Bradley, also intends to compete for the OMFV award, its likely entry, the CV90, is not related to its MPF candidate. The Army, upon taking delivery of the prototypes, intends to run a series of tests to assess their lethality, mobility, and battlefield survivability, with a plan to make a decision on one final vendor in fiscal 2022. Eventually, the Army would like to acquire 14 MPF vehicles for each infantry brigade combat team, with units available for combat by 2025. The failure to make it to the next stage of this competition is a setback for SAIC, a government services firm that has been trying to build its equipment expertise. During the Iraq War, it established a business upgrading unarmed vehicles to better withstand mines and roadside bombs. Over time, that business has expanded to handle additional vehicle upgrades and pursue new contracts. This is the second new program defeat for SAIC in recent months. The company in June lost to BAE in a competition to manufacture a next-generation amphibious combat vehicle for the Marine Corps. SAIC has a lot on its plate as it attempts to close and integrate its $2.5 billion acquisition of Engility Holdings. Winning one of these large platform contracts would have helped the company show good results while that integration process is underway, as SAIC with an award this quarter would have been able to show a book-to-bill solidly above 1.0x. A platform win would have also helped SAIC to bridge the gap between now and fiscal 2021, when the company has said to expect to see strong revenue growth resulting from the Engility deal. SAIC remains determined to seek out platform opportunities. CEO Tony Moraco on a Dec. 6 call with analysts said, "We're looking at broad, complex system integration across the portfolio," including some Army modernization work. But he admitted that much of what is potentially in the pipeline is "probably smaller in scale than MPF." As investments, General Dynamics and BAE Systems have a lot in common, both stocks appear due for an upswing. GD has underperformed its U.S. defense peers in recent years due to troubles with its Gulfstream unit, but those issues should fade in the new year. 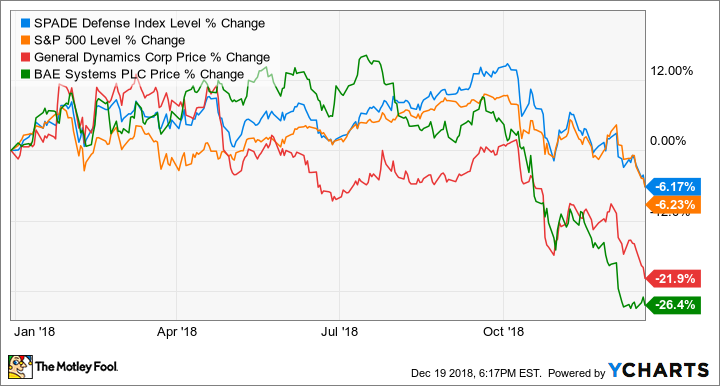 General Dynamics is my top defense stock going into 2019 based on the prospects for a Gulfstream recovery, and the potential upsides from additional defense business. The Army MPF decision is a good start on the defense side, and given the enthusiastic reception the Griffin concept received when it was introduced at the Association of the U.S. Army meeting in Washington in October, as well as the Army's desire for cross-platform compatibility, the GD offering feels like the horse to beat in this competition. BAE is another unloved defense stock. Like General Dynamics, it trails both the S&P 500 and the Spade Defense Index by significant margins year-to-date, due to factors including concerns over growth projections, Brexit-related complications, and more recently, a push by Germany to ban sales of certain weapons -- including Eurofighter Typhoon jets, which are assembled by BAE -- to Saudi Arabia. But the company has enjoyed some solid wins this year, including a $26 billion deal to modernize the Australian Navy. BAE's best opportunity to shake Brexit and European political concerns is to grow its business in the United States, and the Army's embrace of its MPF offering ahead of the upcoming OMFV competition is a step in the right direction. No matter who prevails in the eventual competition, both General Dynamics and BAE look like long-term winners.